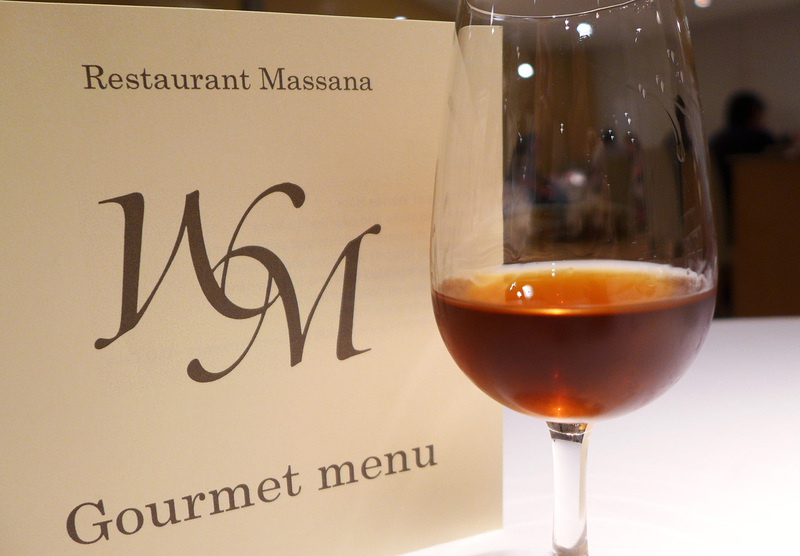 Restaurant Massana , Girona and the dish of a lifetime. Foodie travellers on their journey to Girona will no doubt be heading over to eat at the Worlds number one restaurant 2013, El Celler de Can Roca. Once they`ve had that culinary experience then what else is on offer in the area ? Well Barcelona is the obvious place to head to but that`s about 60 Miles away. Girona itself offers quite a few options , the obvious one being Tapas bars….everywhere does Tapas. Whenever we got hungry we simply hopped from bar to bar buying 2 cold Beers and a small selection of Tapas in each one which was really enjoyable. 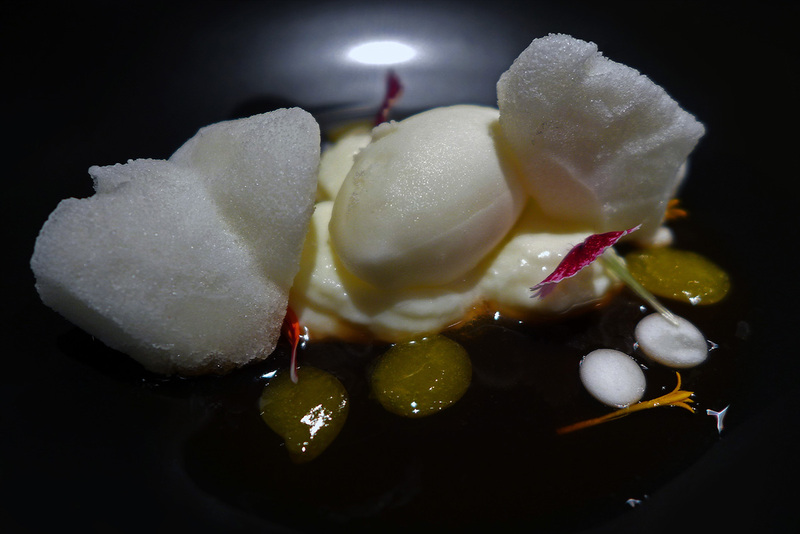 As far as Michelin standard food and fine dining experiences go then Girona doesn`t have a great deal to offer apart from the obvious one. All is not lost though because the restaurant i chose for my Saturday evening slot turned out to be a totally wonderful experience and some of the best food i`ve ever eaten. 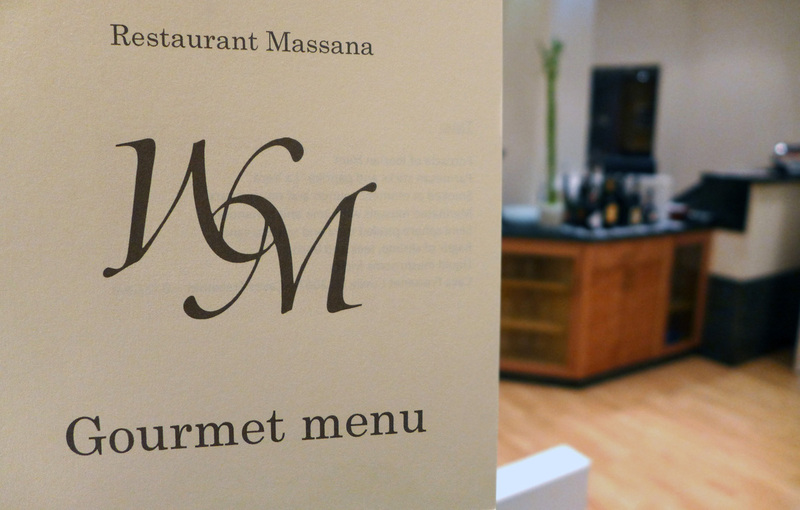 Restaurant Massana is a 1 Michelin starred establishment run by husband and wife team Pere Massana and Ana Roger. 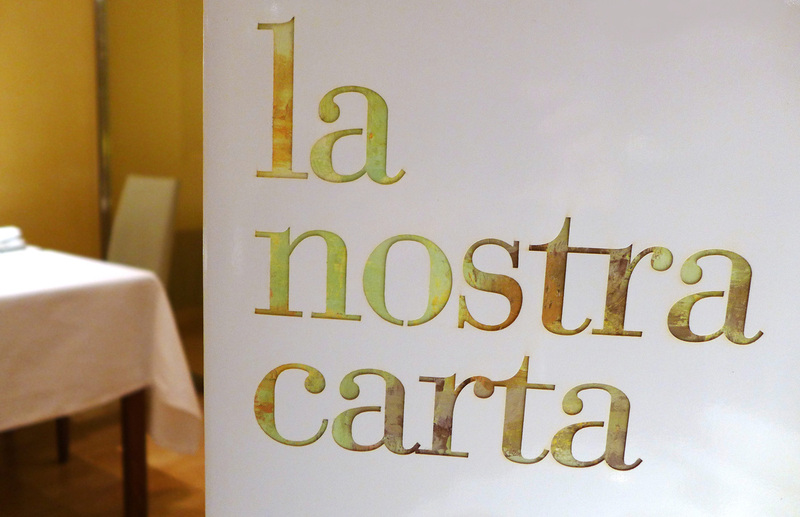 The restaurant has now been open for 25 years serving up refined Catalan cuisine embracing the very best of regional produce. I chose this restaurant after seeing it on the Critical Couple food blog and after googling the current menu it sounded right up my street so i simply emailed them and booked online. 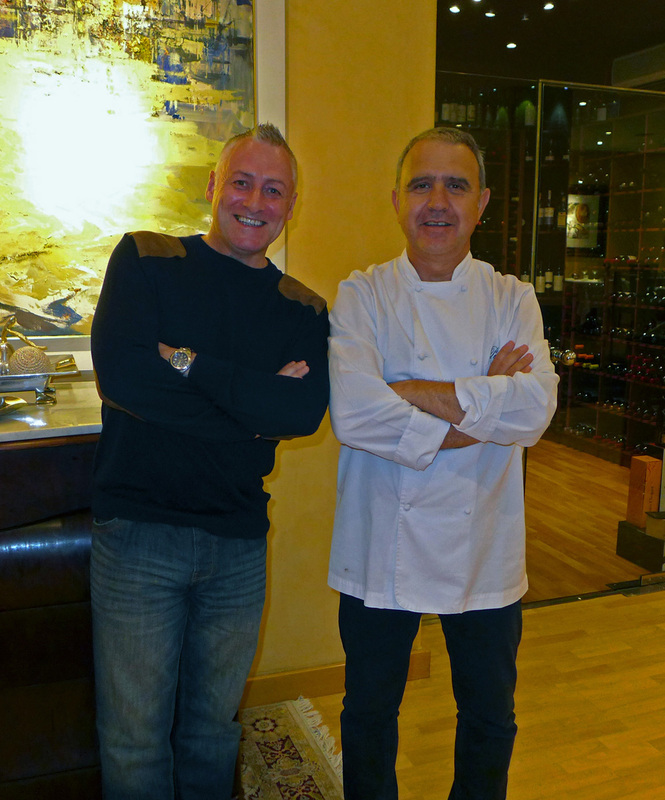 A super double it was then , El Celler de can Roca for Friday lunch and Restaurant Massana for Saturday evening dinner , then back home on the Sunday. Yes….we foodies are totally nuts , its a bloody long way to go from Cumbria to the East coast of Spain for two meals…but worth every Euro. The restaurant sits in the heart of the city , you`ll be best off using ” Maps ” on your smartphone to locate it because if you blink then you`ll miss this place. 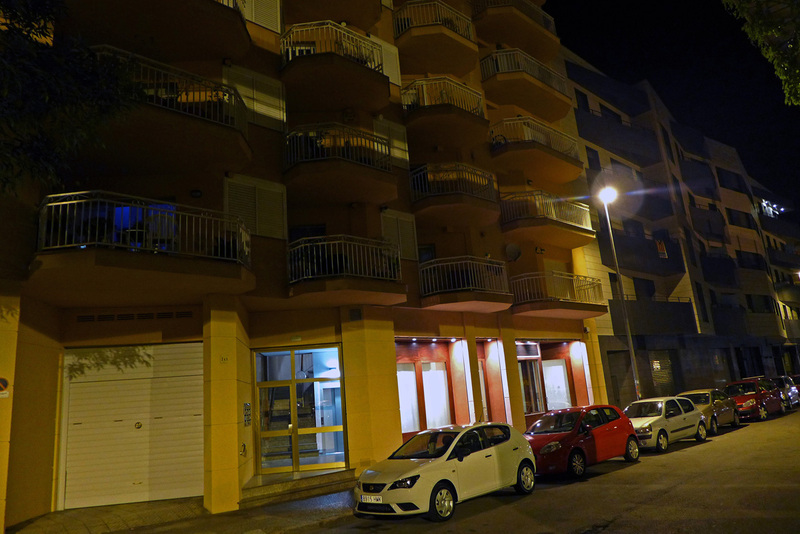 The restaurant is very well disguised and basically just looks like part of an apartment block. My “Maps” guide directed me right to the front door of Massana before i finally spotted the sign.Of course a taxi will be no problem finding the place so no worries there. The diner has 2 options here , A la Carte ( individually priced ) or a set Gourmet Menu consisiting of several tapas courses followed by a 10 course meal for 85 Euro ( £ 71 ) The wine flight is a very reasonable 38 Euro = ( £ 32 ) for 8 glasses of various wines. The choice was an obvious one , Gourmet Menu with wine flight. My son Max decided that he wanted a Mojito when we arrived. One of the staff apologised and informed us that they dont do cocktails but within 5 minutes there was one on the table. They had obviousy `Googled` a recipe and made one in a flash….perfect start. Pere Massana , Chef and owner came over to greet us and welcome us to his restaurant and seconds later the first Tapas arrived at the table and we were straight into our food. 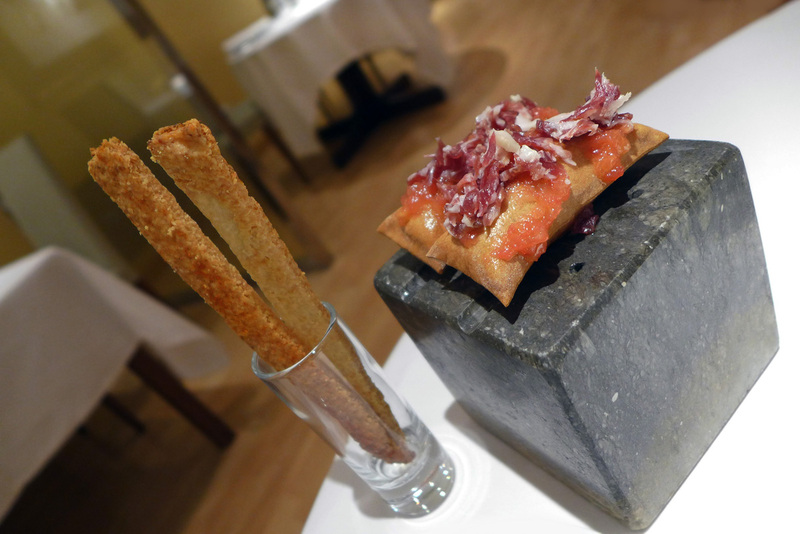 Foccacia of Iberian Ham – Prime trimmings of fine quality Jamon on a fresh Tomato pulp set on a cripy wafer. 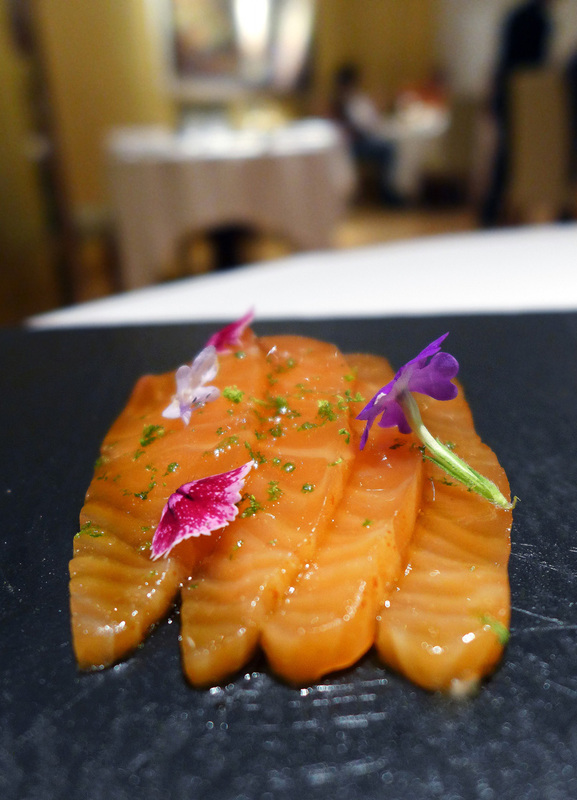 Smoked “at moment” Norwegian Salmon with Citrus and Ponzu sauce. – Really fresh slices of Salmon which were smoked very gently prior to leaving the kitchen. 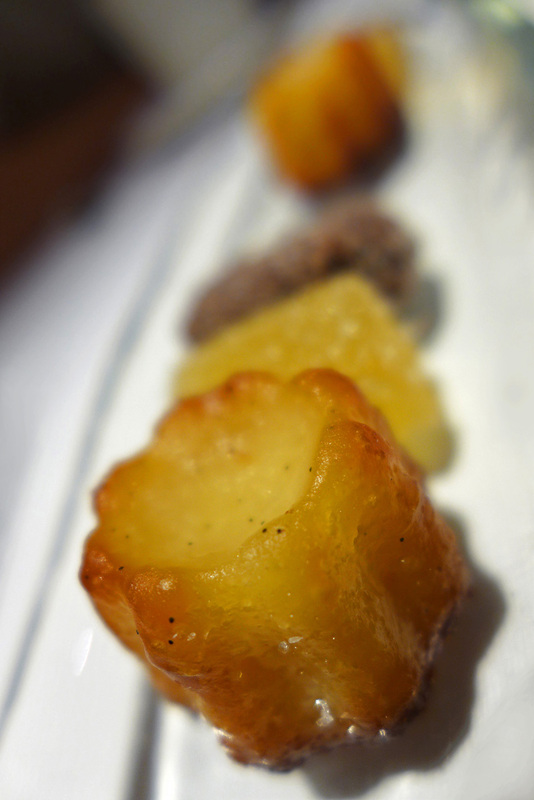 These were served covered in Bell Cloche jars and uncovered at the table perfuming the whole restaurant of fresh smokey Oak aromas. 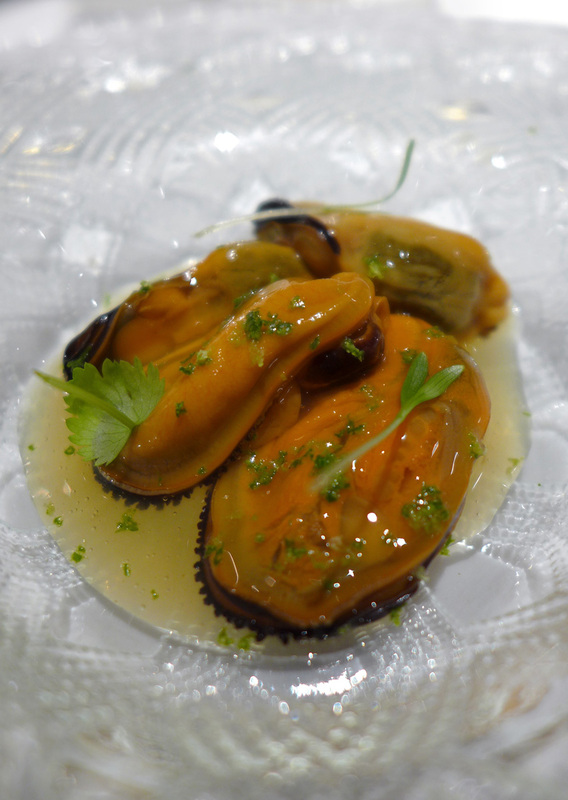 Marinated Mussels with Lime and Coriander. – Tender and succulent , perfectly cooked and `just` enhanced with the minimum of accompanying ingredients. 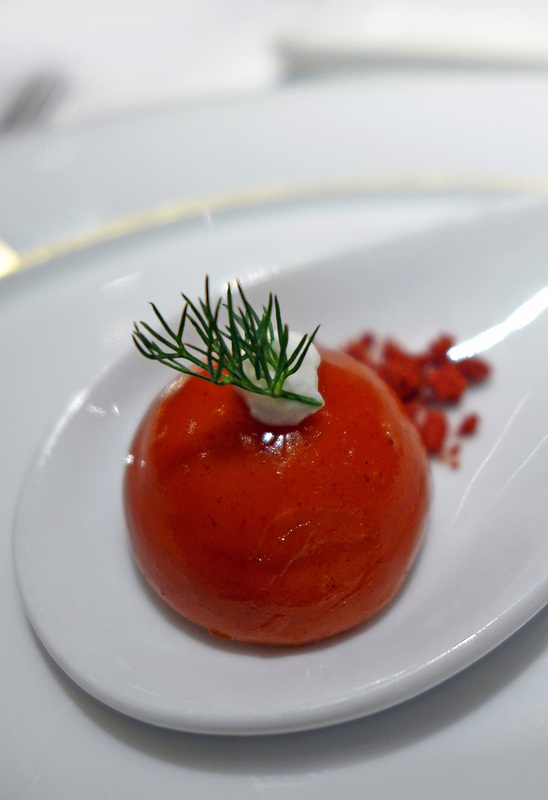 Semi sphere of pickled Tuna and Tomato sand. – A one bite liquid burst of very Tomatoey flavours. Bagrir ( Moroccan Pancake ) of Shrimp , Leek and Bacon. 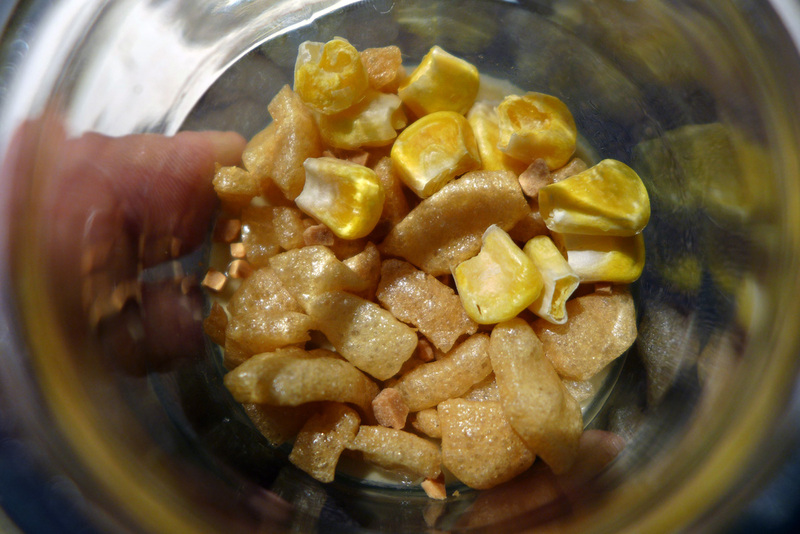 – I could definitely have eaten an awful lot more of these. 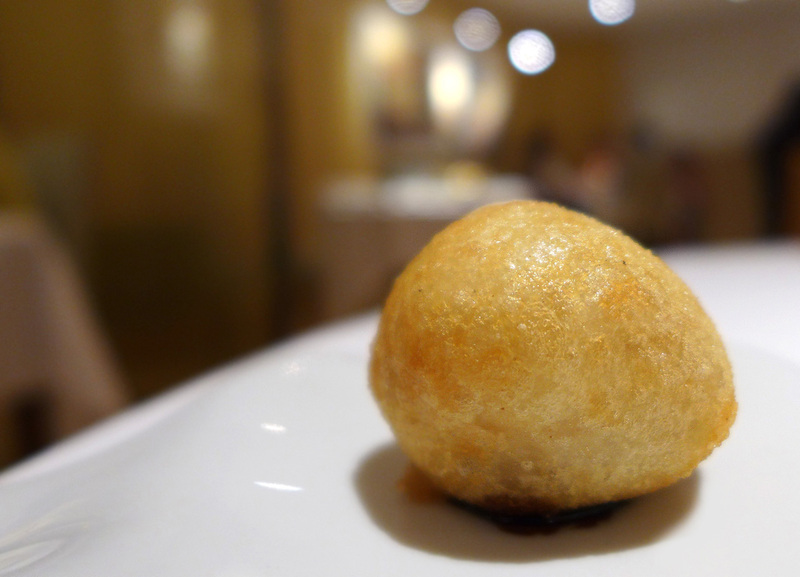 Liquid Cep Mushroom fritter. 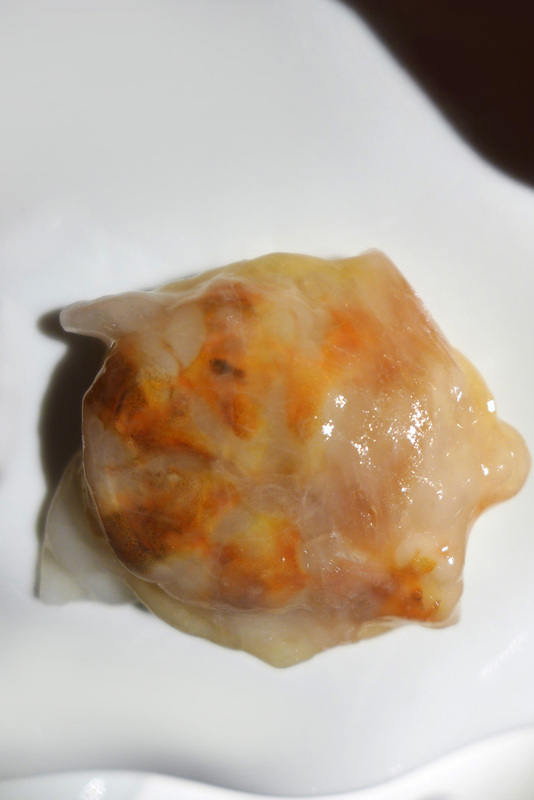 – Once again this was a `one bite` experience with the intense flavour burst of Liquid Ceps ( Porcini ) wild mushroom. 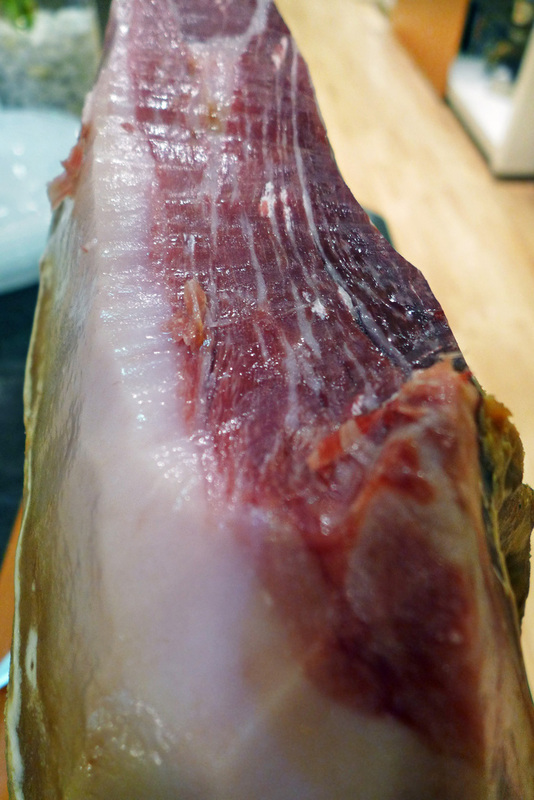 Iberian Pork Ham ,”Dehesa de Extremadura” 2009 reserve ( From the Black Acorn fed Iberian Pig ) – Chef Massana smiled as he walked out of the restaurant and over to the leg of Jamon with his serrated knife.Affter slicing off a small plate of ham he came over to our table. 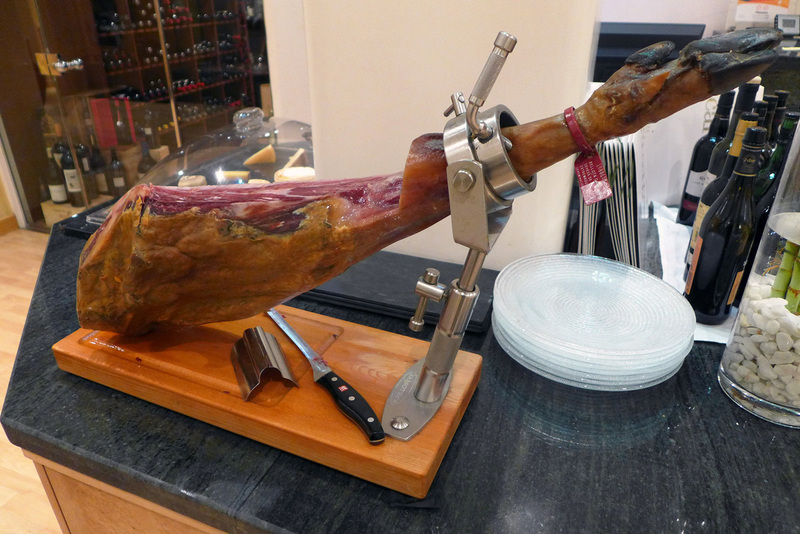 This Ham was available as a starter for 25 Euros but Chef sensed that we were both here because we genuinely love our food and would appreciate this wonderful taste of Spain on a plate. 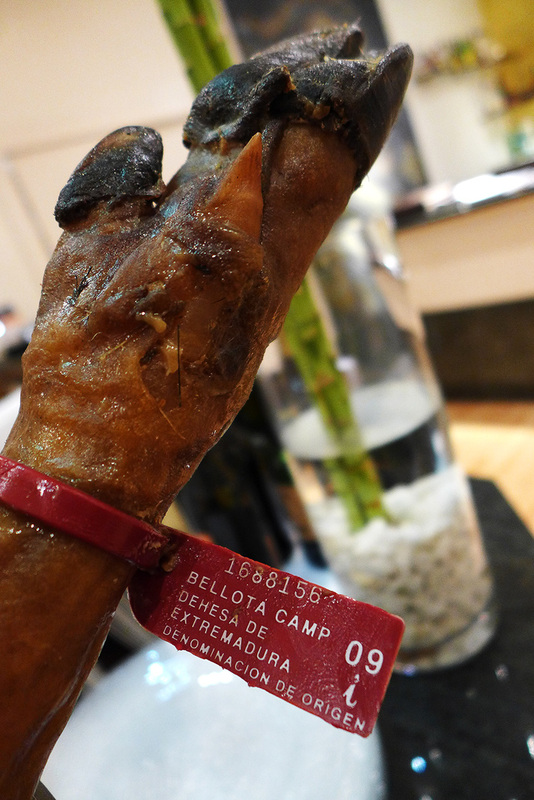 This was the very best 4 year old Jamon Iberico that money could buy….and a little gift from the kitchen. The flavours were very creamy and fragrant and the ham fat just melted in the mouth . 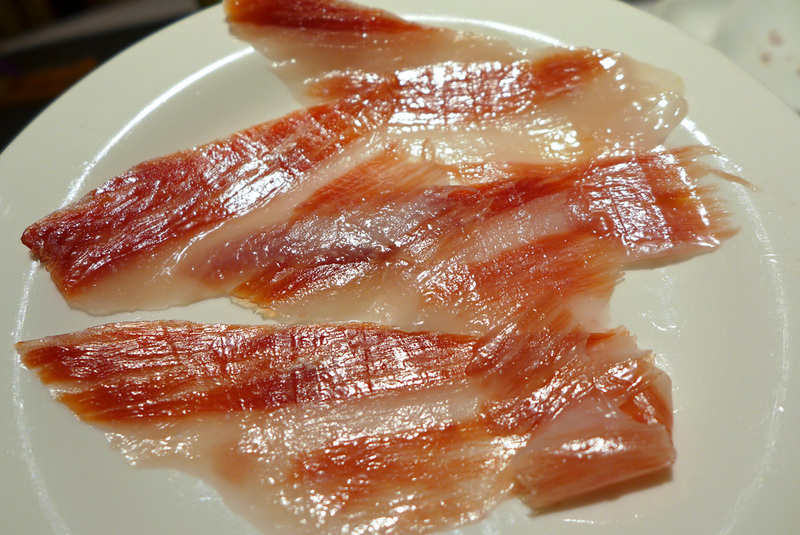 A normal Jamon would take between 18 and 24 months to reach its curing maturity. 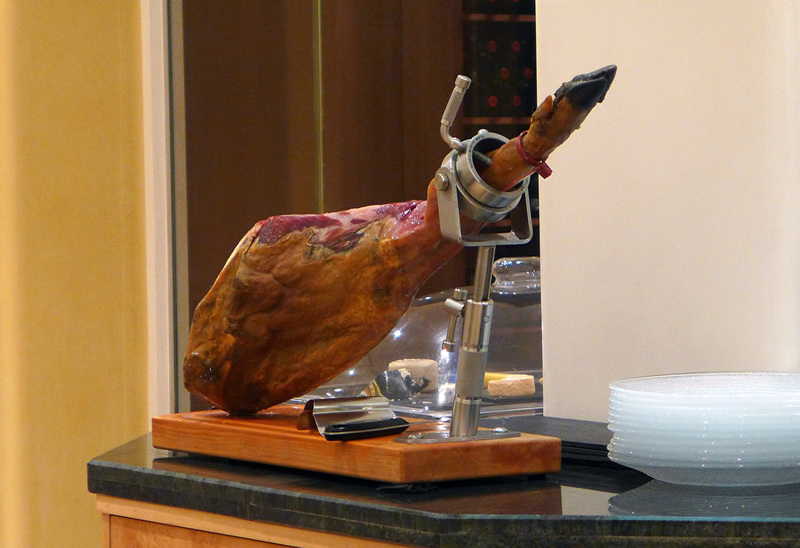 This ` reserva ` was 48 months of age….Beautiful. 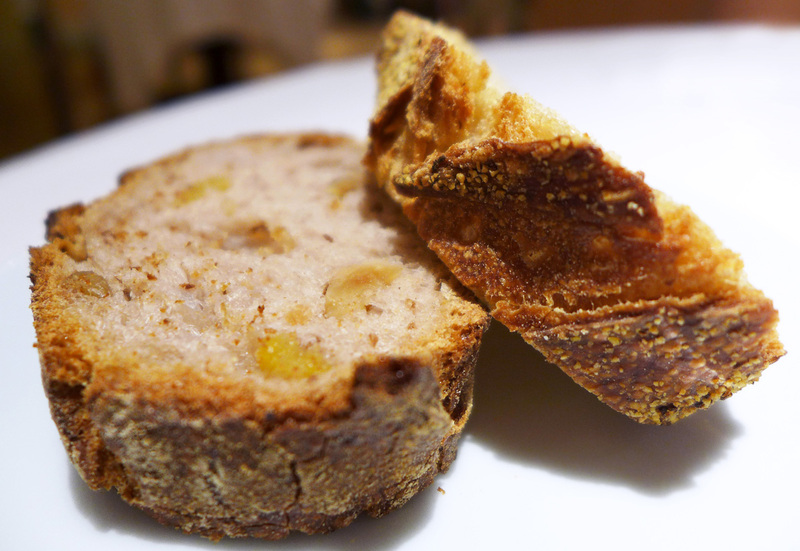 Massana choice of Bread was only 2 varieties , both were absolutely perfect…but No Butter , same as Can Roca….Must be a Spanish thing. 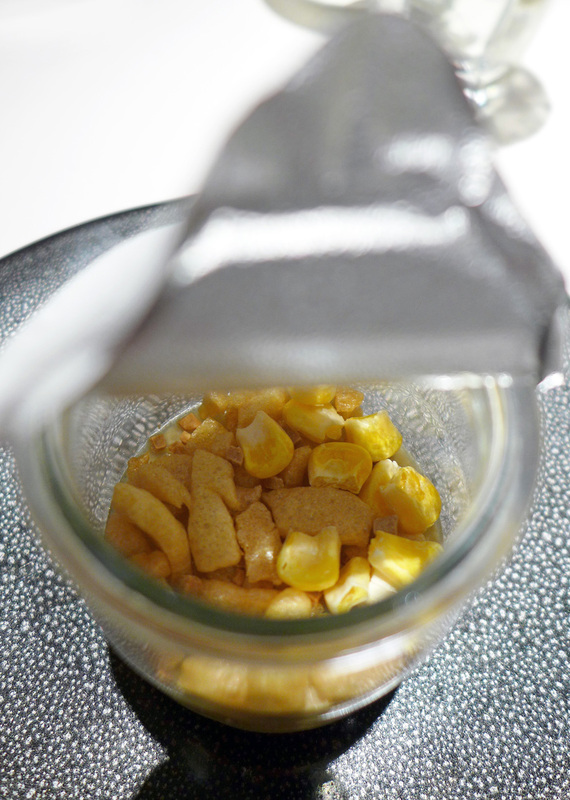 Yogurt Foie Gras as a Royal with Muscat Jelly , Crunchy Corn and Toffee.- One to eat very slowly and definitely one small spoonful at a time..with a sip of Sauternes wine in between. 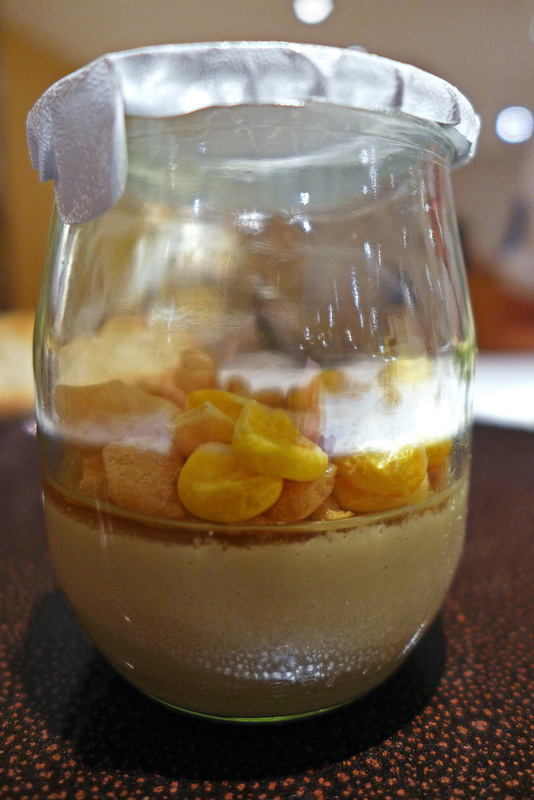 Creamy Foie gras and Sauternes are simply one of lifes greatest gastronomic marriages and one of the best combinations of food and drink anyone will ever experience on this planet. 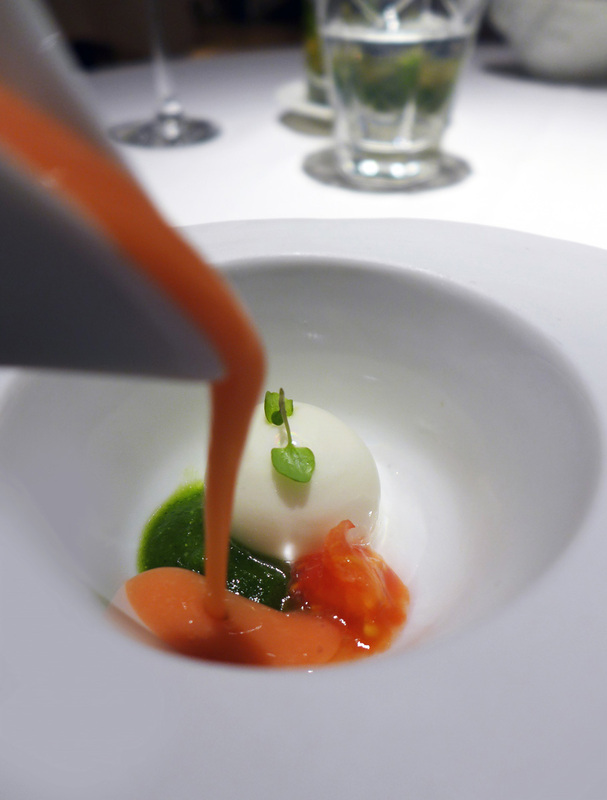 Buffalo Mozzarella spheres , Pesto , Tomato soup and Caviar. – Fresh flavours and simple food that just tasted awesome. 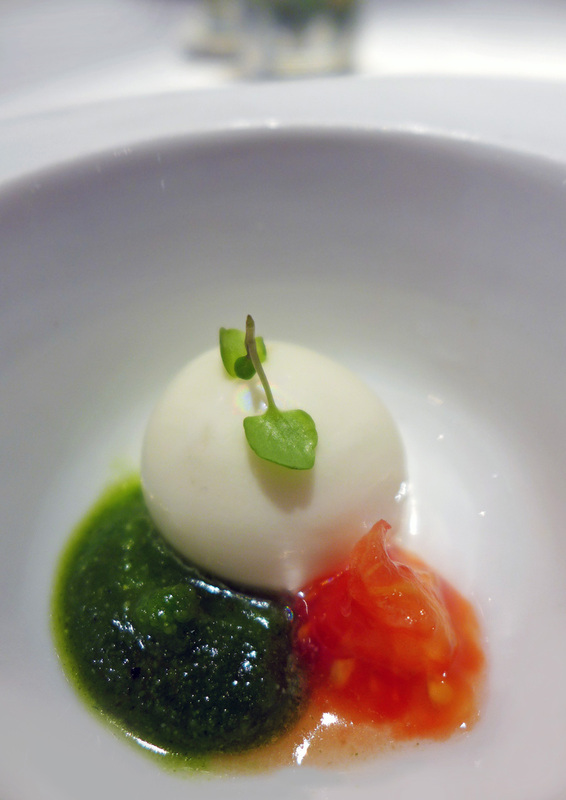 Mozzarella , Tomatoes and Freshly made Pesto. Another classic meeting of flavours that totally complement each other. 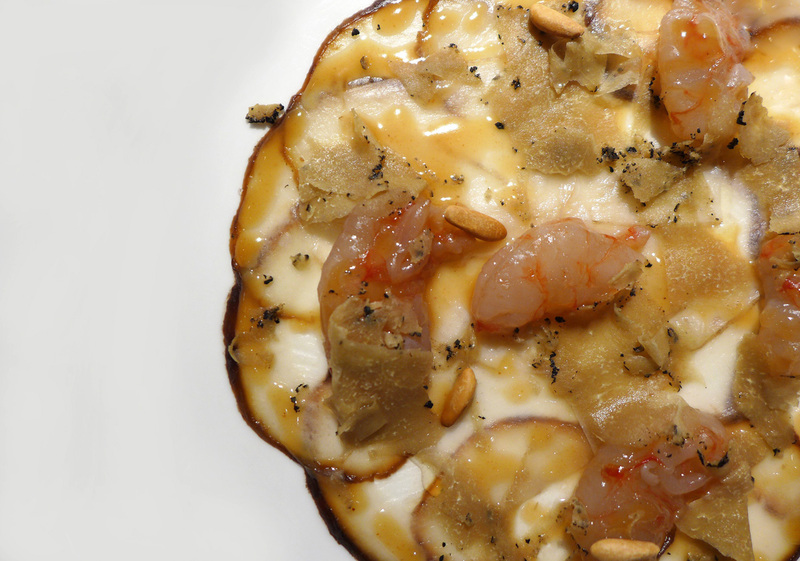 Wild Mushrooms , Prawns and Truffle Carpaccio , Marinated Prawn and Pine nut vinaigrette. – O…..M….G This one was one of my `closed eyes` moments and came with concerned words from Max , my son ” Dad….are you alright ? ” I had actually drifted off into the heavens for a brief moment in time and after just one mouthful i had discovered my best dish of the year and infact one of the most delightul taste experiences of a lifetime….. Yes , a lifetime , it really was that good. We had been advised to make little parcels out of the ingredients and to try and get a small piece of everything into each bite.I done just that and immediately put my fork back down on the table again. The flavours and textures here were mind blowing. 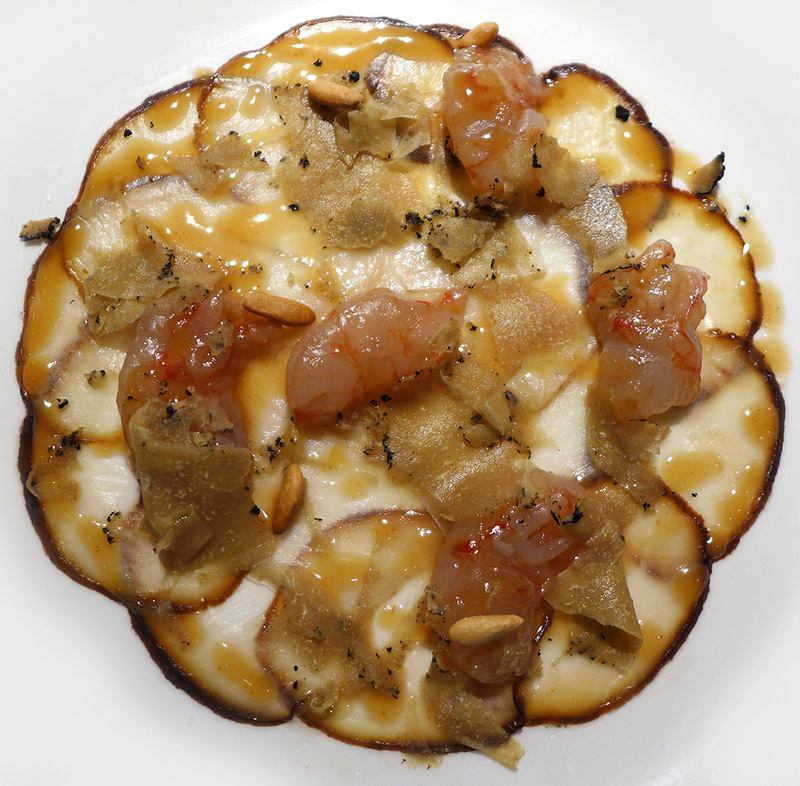 Soft wafer thin slices of fresh raw Cep ( Porcini ) mushroom topped with Marinated `raw` Prawns , slivers of fresh Summer Truffle , Toasted Pine nuts and a Pine nut dressing….Oh wow wow wow…. Ive never eaten anything so slowly. 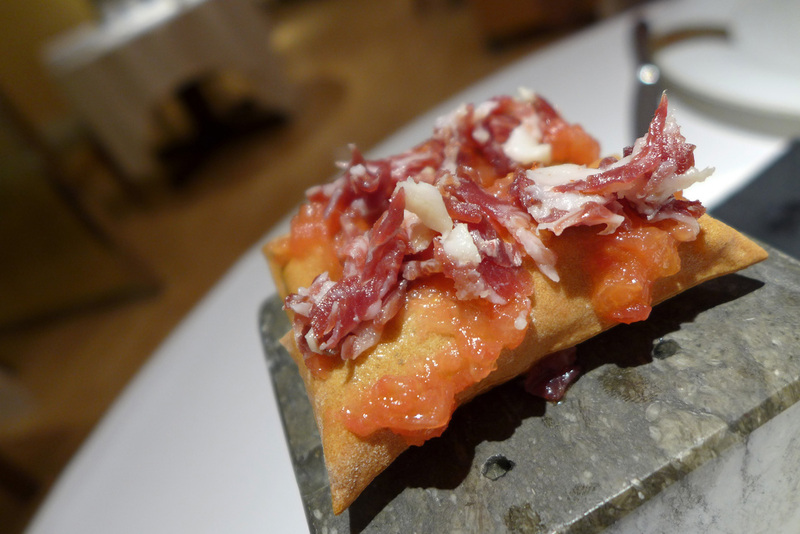 I would fly all the way back to Girona for this one plate of food….That`s how good it was. So when you come to Girona if you try nothing else then please go and sample this one. When I returned back to the UK from Spain , this dish was constantly on my mind.It was quite a journey for me to return to try it again and so I set out to re-create the flavours from Massana at home using local ingredients. 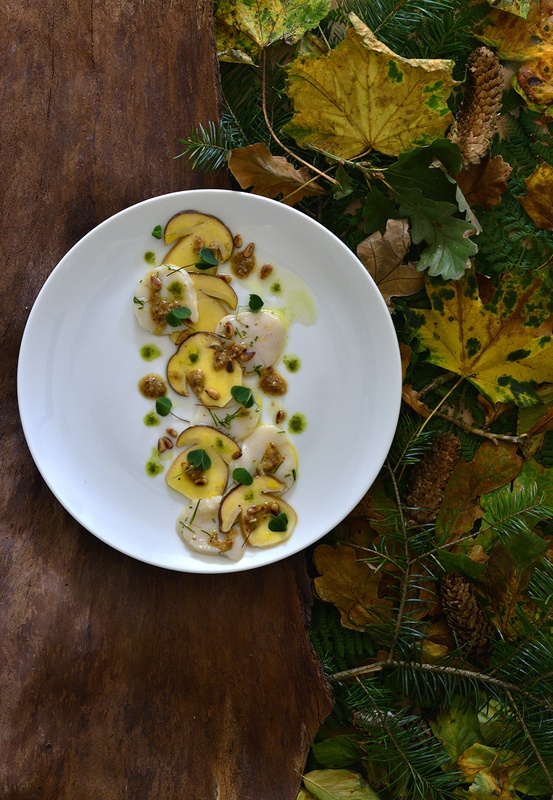 Local marinated baby Ceps ,Isle of man Scallops marinated in citrus and Douglas fir ( pine ) , Wood sorrel leaves and Puree , Pine nut dressing and White Truffle oil….and the taste ? Well I think I just about hit the flavours almost perfectly. Roast Scallop , Cucumber , Lemon and Dashi broth. 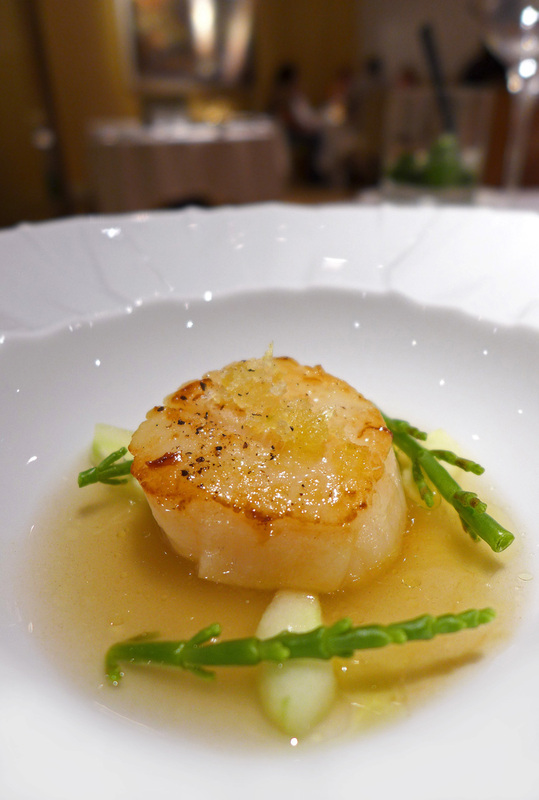 – Well cooked large Scallop with a delicate perfumed broth and flavours of Citrus. 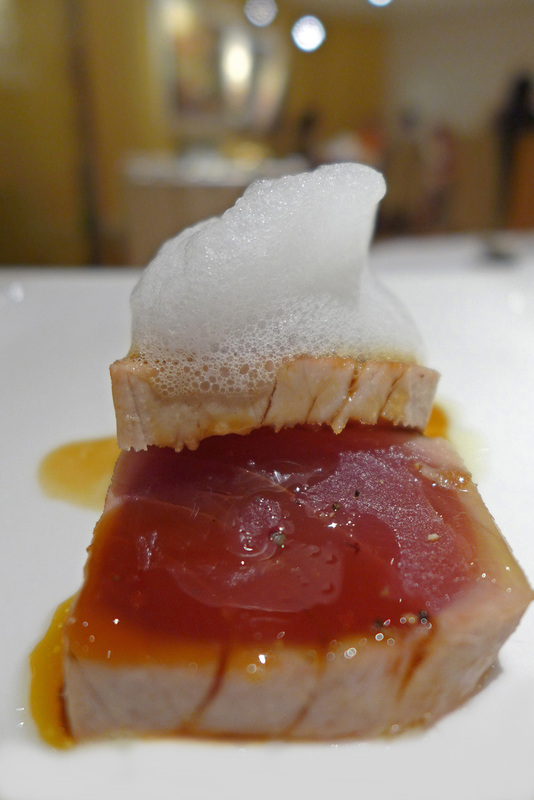 Red Tuna on a Lentil Stew “Beluga” veil of Bacon , Wakame seaweed and Sea air. 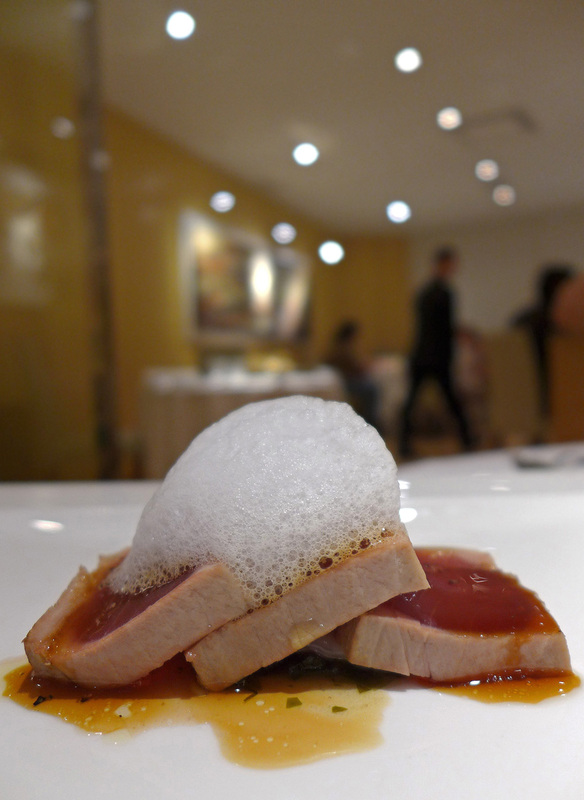 – A rare piece of very fresh Tuna with nicely paired accompaniments. The `Sea air` was exactly that…A sea water foam. 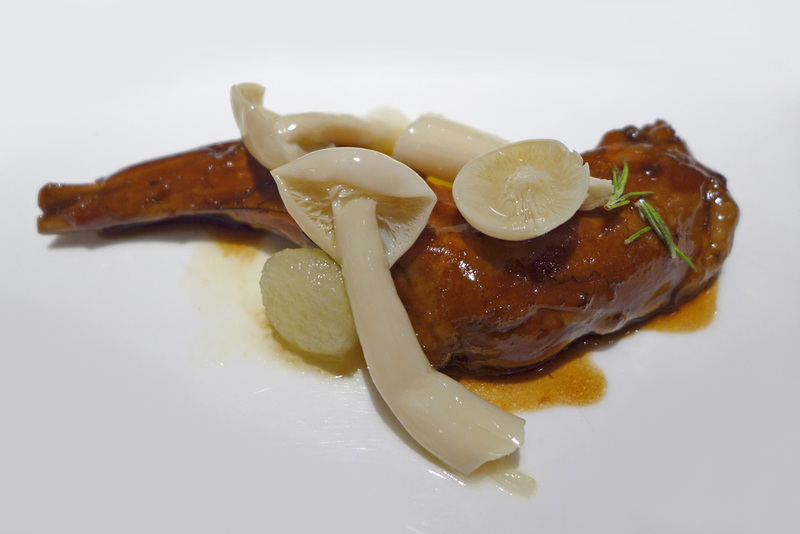 Rabbit shoulder laquered with herbs and Apple Rosemary. – A very simple plate of food here , 3 components on the plate and needing nothing else. 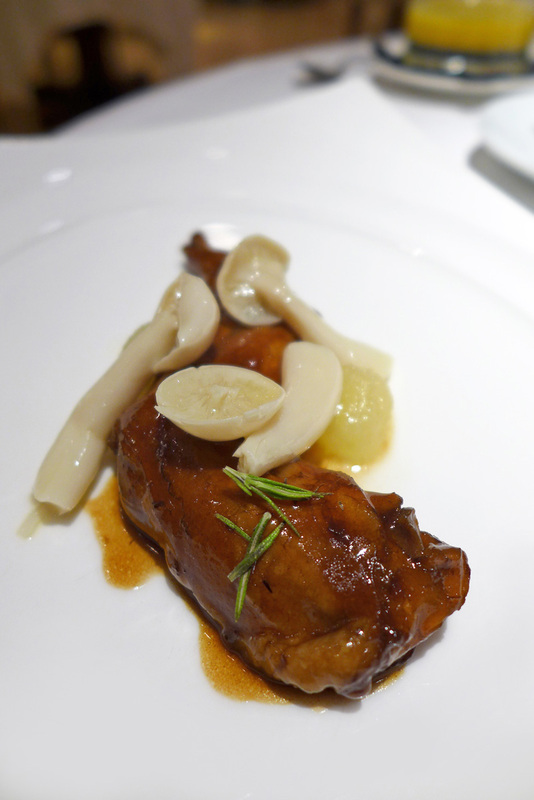 The Rabbit leg cooked long and slow ,glazed in a rich sauce and freshened up by the addition of sweet Apple and aromatic herbs. 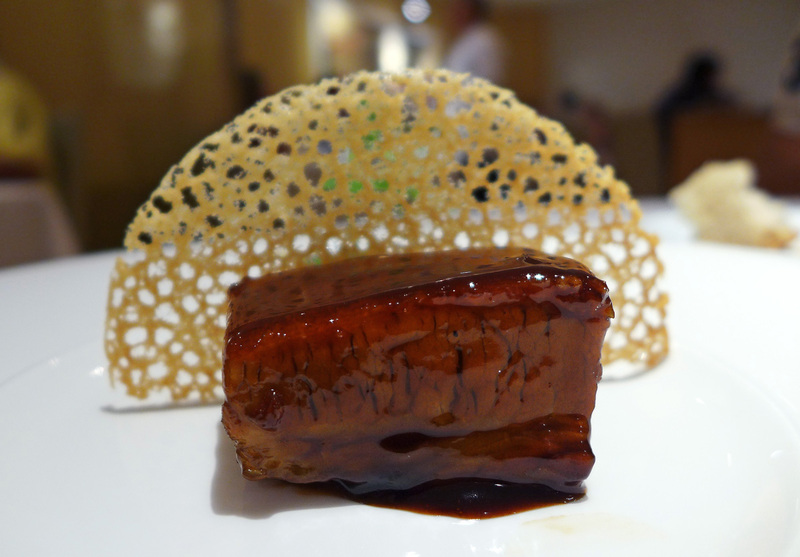 Laquered Iberian Pork , Aubergines , Black sesame and Wheat cracker. 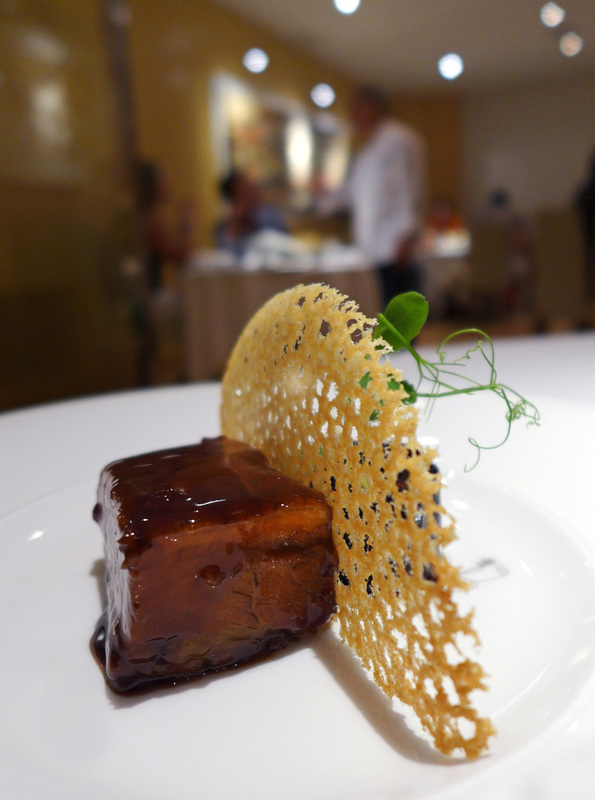 – It was so nice to eat Pork that tasted of Pork during this course.The meat was glazed heavily with a high gloss reduction of the cooking liquors which offered up really nice flavours. Coconut , Banana Guacamole , Sugarcane and Pina colada ice cream. – And so on to the desserts and my favourite part of the meal. 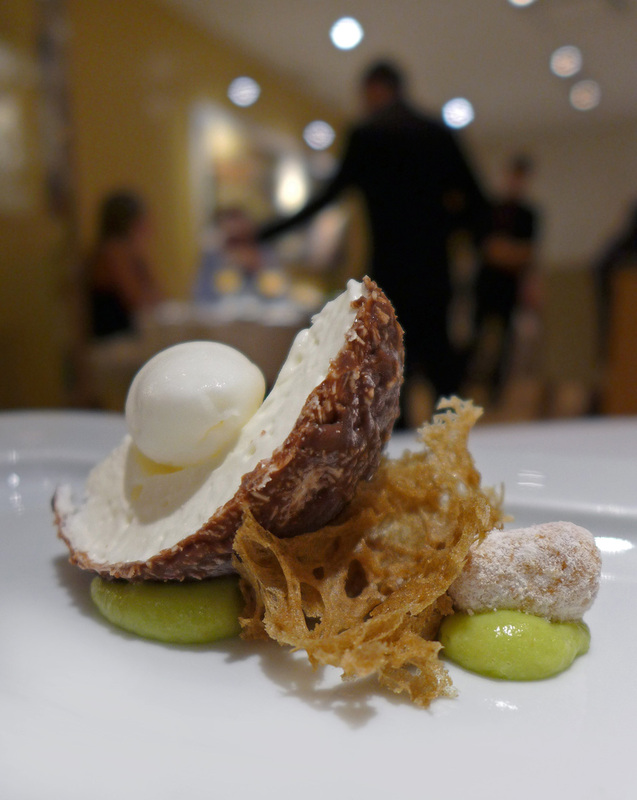 This one didnt disappoint at all.The Pastry chef was rather creative in this dish of a realistic looking Coconut in a chocolate coconut shell with Pina colada flavoured ice cream sitting on top. The Sugarcane sponge and the Guacamole Banana sauce or whatever it was all went really well together. 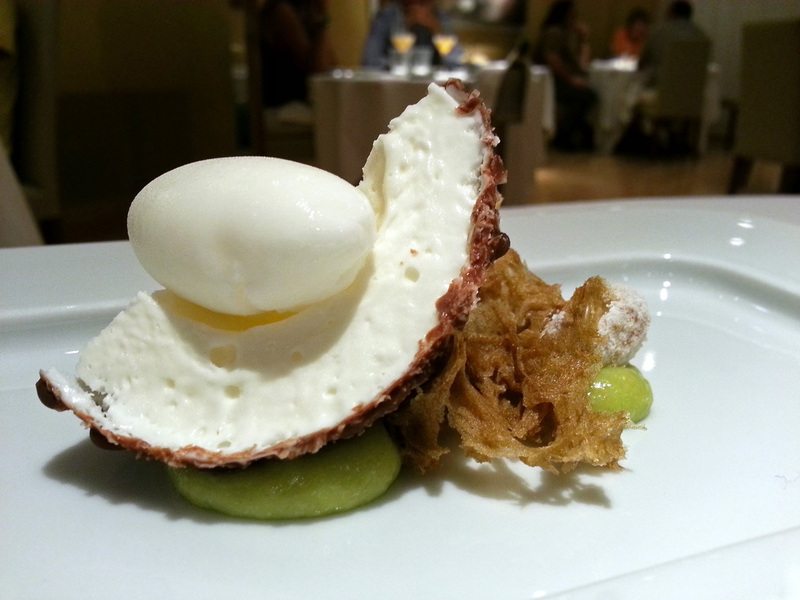 Unfortunately I can`t remember what this dessert was….Probably due to the wine flight taking another victim. Perhaps someone can remind me. 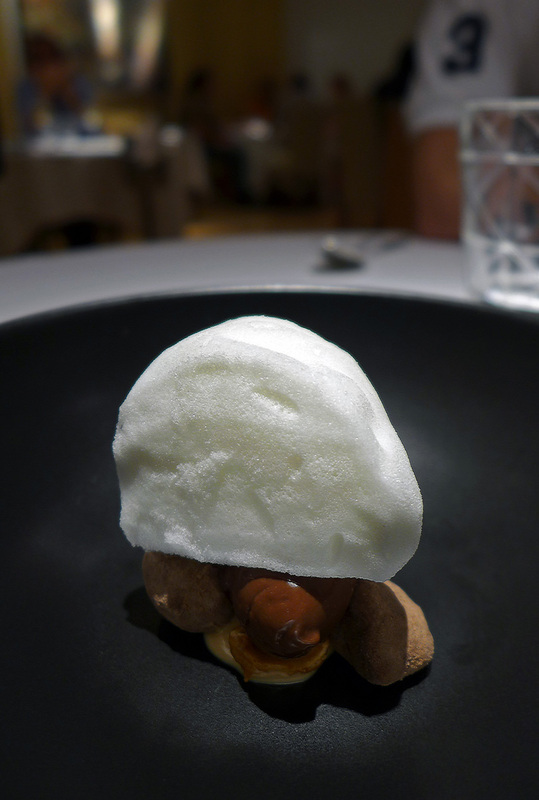 Chocolate , Peanut and Lemon , Creamy Chocolate , Snow of Lemon with sugared Peanuts. – This was so weird , it was like actually eating a Lemon snowball and had exactly the same texture and feeling as eating a piece of compacted fresh snow.. I was gutted when i checked the menu to see that this was my last course…i really could have eaten another two or three dessert courses…. Maybe next time i`ll do a deal…..Oh and there will definitely be a next time. It`s a long way to get to Girona from the English lakes but ill be back to Massana if nowhere else. 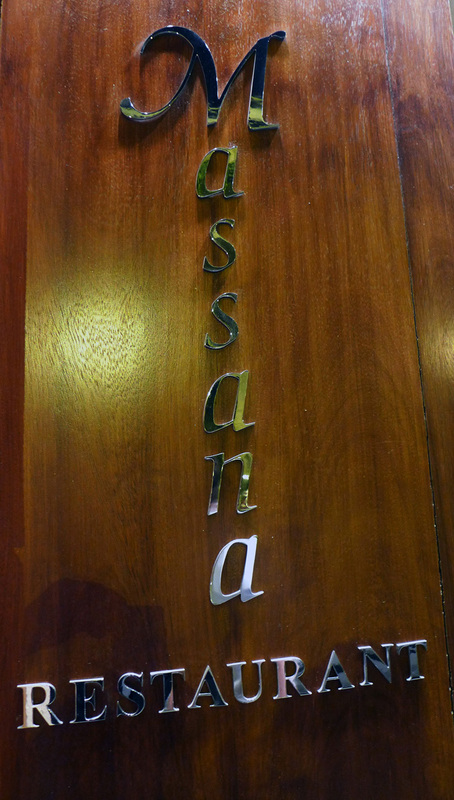 It was mentioned on another foodie blog that this restaurant was, at the time , running away comfortably on a 1 star level and the only way forward for Massana was to address their weaknesses and attention to detail. I believe they have now done that and in my eyes this restaurant is definitely cooking at a solid 2 star level now….Time will tell and i wish them lots of luck. Genuinely nice people. To view the full set of photos then please CLICK HERE. Coffee , a very reasonable 2.2 Euro ( £ 1.85 ) and Petits fours. 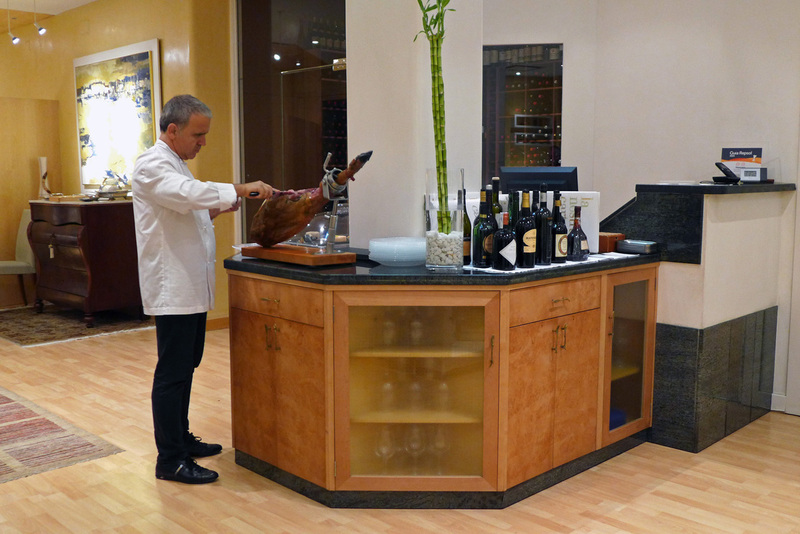 Chef Massana must have spotted me lurking close to the wine store and so decided to stand guard….The Wine doorman makes a stand….he wouldn`t budge. Previous Post The Best Restaurant in the World ? Next Post Bo.lan – Bangkoks best traditional Thai dining experience. Looks great, stunning pics as ever. Sounds like pretty good value too. This meal looks incredible. A-ma-zing. Hi, I’ve been reading your blog for a while and this review made me want to go there. Fortunatly I’m in the South of France for a vacation week and just went to the restaurant this afternoon. Your review hit the nail on the head: wow. 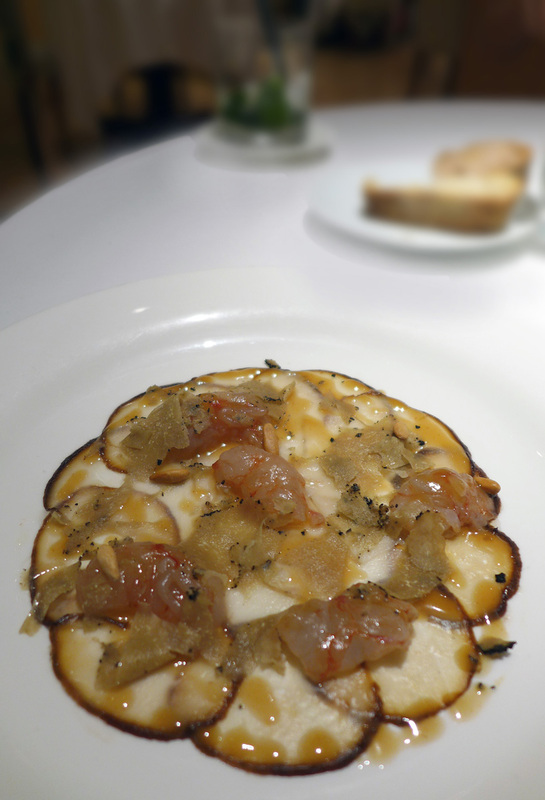 The foie gras and porcini with prawns were exceptional and no major let downs. Definitely worth the travel! Told you so…it`s an amazing dish isn’t it ? So glad you`ve experienced it. Absolutely amazing, very inspiring too. Given me a few ideas. I love your version of the cep and prawn dish. It looks just as good. 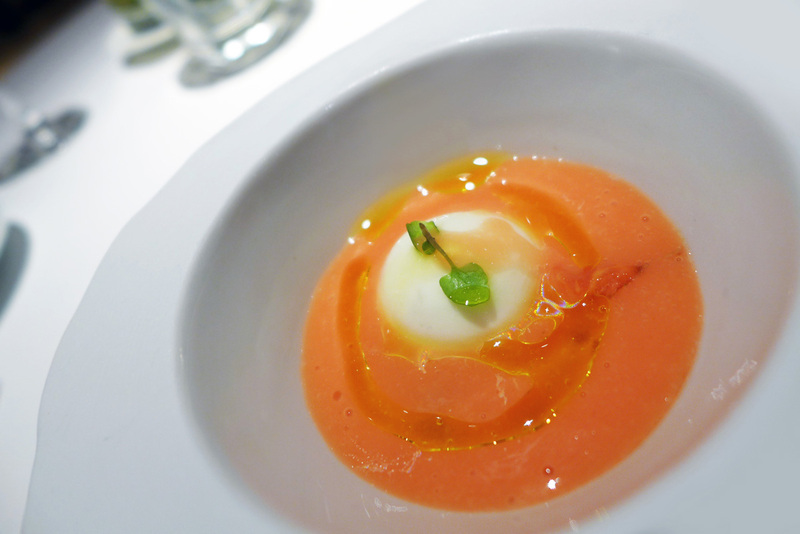 We are thinking of going this summer, we’ve done El Celler de Can Roca twice now and fancy a change! You wont regret it , he`s a great chef.